Wildlife is integral to the ecosystems on which people rely for survival. Yet across the globe, wildlife is under threat, with a broad range of species being driven towards extinction. Global wildlife populations have fallen by more than half in just 40 years as measured by WWF’s Living Planet Report 2014. Conserving the world’s wildlife is an enormous challenge, but progress is possible. Remarkable successes have been achieved in bringing wildlife populations back from the brink. Together, we can ensure that the world’s wildlife has the space and resources it needs to thrive in harmony with people. WWF’s Global Goal: The world’s most iconic and endangered species are secured and recovering in the wild. Vietnam is the home of a spectacular variety of fauna. Every year, new species are discovered and described. One spectacular discovery in 1992 was without doubt the Saola. The find proved to be the first large mammal new to science in more than 50 years and one of the most spectacular zoological discoveries of the 20th century. This incredible biodiversity is however threatened by habitat loss, degradation and fragmentation as well as widespread illegal hunting. Once being abundant in Vietnam, the population of the iconic Asian elephants has been reduced to a few hundreds. 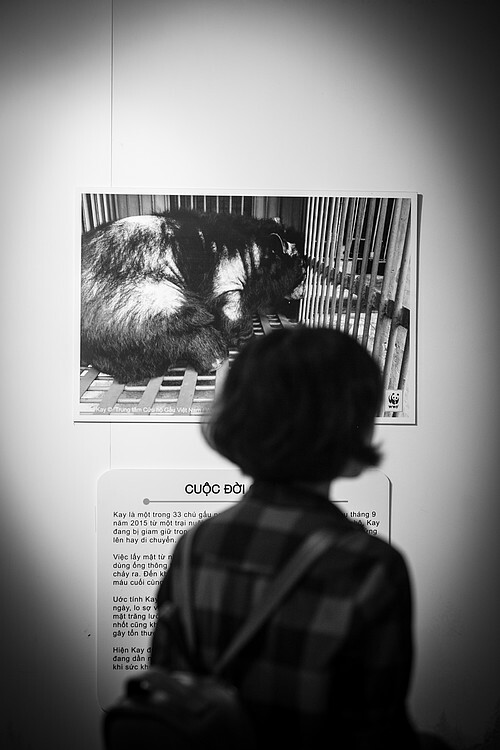 Sadly, Vietnam is a major source, transit and end destination for trafficked wildlife. The illegal wildlife trade is worth an estimated 8-10 billion USD p.a. in Southeast Asia and severely affects species native to the region as well as species from overseas like rhinos and African elephants. WWF-Vietnam is focusing its conservation efforts on Elephants and Saolas. By focusing on, and achieving conservation of these 2 species, the status of many other species which share the same habitat – or are vulnerable to the same threats - may also be improved. WWF-Vietnam is also addressing the poaching, trading and consumption of local and regional species which are consumed as wild meat delicacies. Addressing poverty & livelihoods: effective community-based conservation models have been integrated into land-use plans, demonstrating strong results to sustainable natural resource management and livelihood development. Consumption of wild meat and other wildlife products in Vietnam fuels the poaching and trading of species native to the forests of Vietnam, Laos and Cambodia. WWF-VN is working to reduce this consumption by delivering targeted campaigns in urban centers that have been identified as wildlife trading and consumption hubs. WWF has partnered with TRAFFIC to work with corporates in Vietnam to encourage them to adopt a culture of zero-tolerance towards consumption of illegal wildlife products such as rhino horn. Since the discovery of Saola, WWF has been involved with the protection. At the end of the 2000s, WWF has supported in the establishment of protected areas for Saola. Along with efforts in the restoration of forests, home of elephants and other wild animals, WWF is working in some projects to improve capacities for official rangers and implementing Asia Wild Elephant conservation project (funded by International Investment Bank) at Yok Don National Park in monitoring and evaluating the population of elephants in Vietnam’s forests. Read more about the Wild Asian Elephant in Vietnam on the Story of Jun.